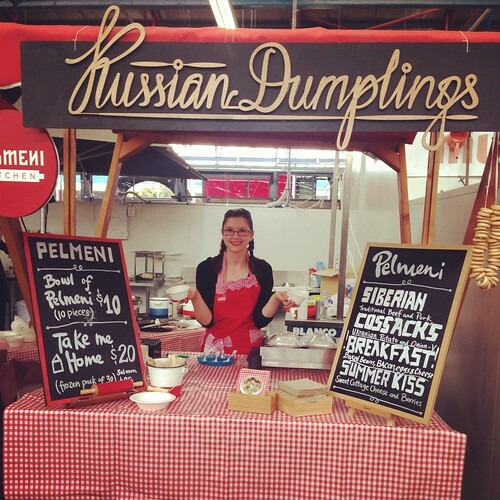 Just because I haven't published a blog post for a while doesn't mean I haven't been beavering away behind the scenes here at Melbourne Gastronome. 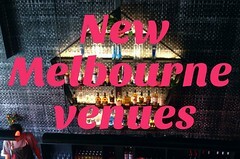 I've finally brought my New Melbourne Venues and Melbourne Venues Opening Soon pages up to date, after the distractions of a five week trip to the US and moving house and being without home internet (HURRY UP, iiNet/Telstra). 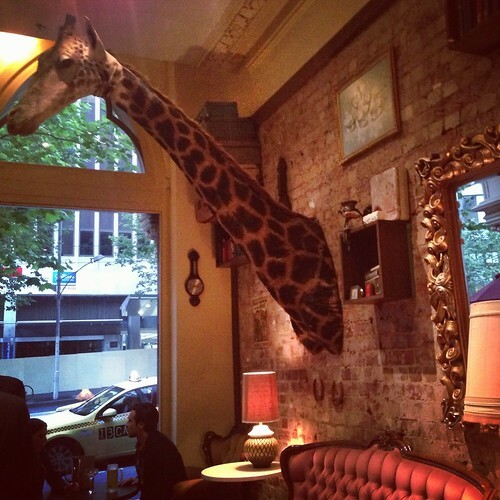 I've written little snippets about all the places I know of that have opened in Melbourne since 1 July 2013, or are going to open soon. Which ones have I missed? This week alone the newbies include Andy Bedford's Charlie's Restaurant that opened yesterday in the site that was Marmalade and Soul, and the Van Haandel's Trocadero reborn as Fatto Bar & Cantina, opening tonight. 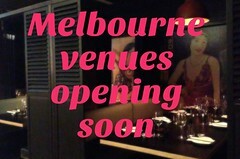 Next week it's South Side Huxtaburger and Gelato Messina - expect huge crowds at both. 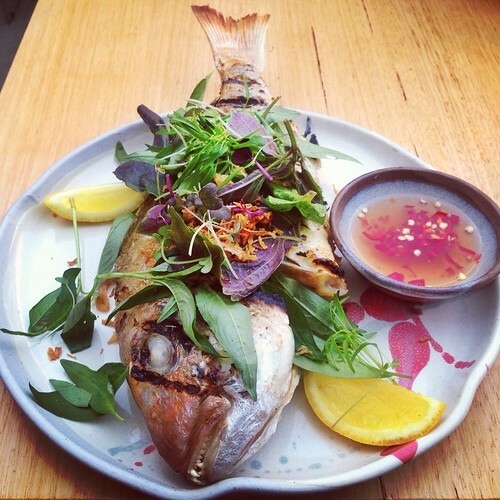 And I was interested to learn that Dylan Roberts (former sous at Cutler, last seen running the Claremont Tonic kitchen) is consulting on a restaurant soon to open a few doors down from Hanoi Hannah. For more details see here and here, and keep checking back for updates. 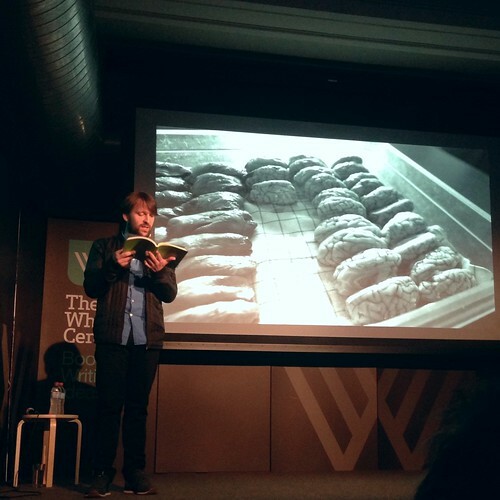 - Good Food Month has kicked off - I attended the launch party last week and was impressed with Special Guest Star René Redzepi's candour in his speech about the meltdown he experienced over the pressures of going "from zero to hero" with Noma. He gave a great presentation the following night at The Wheeler Centre too. Browse the Good Food Month website for details of particular events: it runs until the end of November and there are over 300 events to choose from. - As a fervent fan of the film CAT ON A HOT TIN ROOF (starring Elizabeth Taylor and Paul Newman at their most smoking), I'm really looking forward to the Culinary Cinema movie matched dinner my gal BurgerMary is organising next week on the 14th with The Baron Said. If you're more of a Tarantino fan, they're doing a DEATH PROOF matched dinner on the 30th of November. Click for details. - StreetSmart's DineSmart event runs from 11 November to 31 December 2013. I've been a fan of this initiative for years. Diners at participating restaurants are asked to make a small donation to StreetSmart on their bill ($2 or more), 100% of which goes to local grassroots charities supporting homelessness. 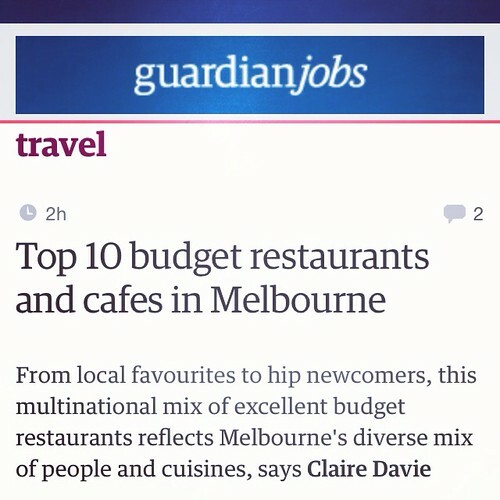 And for those of you who didn't already see me spruik it via social media, I wrote an article a few weeks ago for The Guardian on the Top 10 budget restaurants and cafes in Melbourne. What do you think of my list? I steered away from the obvious usual favourites like A1 Bakery, but the brief was to write about budget places in areas that are easily accessible by tourists. I decided budget meant all menu items are roughly <$20, and I tried to ensure the list had a mix of cuisines and old and new (though looking back on it now I wish the south side was better represented). Oh and to the guy who left a sarcastic comment about Thai slaw - it WAS som tam, you twonk. Thanks for letting me know Michael! Will update the list tonight and add it. Great list Claire - no surprise there of course! I absolutely love Moors Head. I don't live anywhere near it, but find myself there every couple of months. It's such great value for quality and service. And the ning-nong of the day award goes to Som Tam dude. There's always one! I think my favourite commenter on that Guardian article (apart from the "Are you MAD!!!" one) is the guy whose rant segues bizarrely into rambling about the opera Tosca. I figure your guardian article must have got good exposure as I read it when my sister in ireland shared it on facebook! guardian readers really are the worst pseudo-intellectual whingers going around. I thought it was a good article, so thanks.